Shop for women's apparel at reduced prices at the Daniele Bardis Sample Sale. Shop for wedding dresses at reduced prices at the Louise Selby Sample Sale. Email louise@louiseselby.com to book an appointment. Take 50% to 70% discount on wedding dresses at The Couture Gallery Sample Sale. Call 0207 792 3100 to book an appointment. 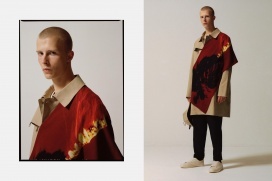 Take 50% to 75% discount on women's apparel and footwear at the Micol Ragni Sample Sale. Boots sizes 38 to 41. 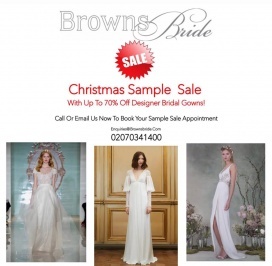 Take up to 70% discount on bridal gowns at the Browns Bride Sample Sale. Call 0207 0341400 to book an appointment. Take up to 70% discount on women's RTW and accessories at the Aries and Hillier Bartley Sample Sale. Shop for men and women's RTW, swimwear, underwear, loungewear, and accessories at La Perla Special Sale. Take up to 70% discount on women's apparel from Cloe Cassandro and Paloma Blue at the LOVE BRAND & Co Sample Sale. Take up to 60% discount on jewellery pieces at the Astrid and Miyu Sample Sale. Shop for jewellery and handbags for women at reduced prices at the Nadia Minkoff Sample Sale. Take up to 75% discount on women's apparel at Rejina Pyo Sample Sale. 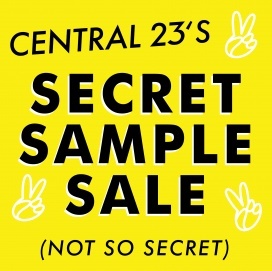 The Sample Sale will be comprised of archive items. Take up to 80% discount on women's apparel, accessories, footwear, and homeware at the S120 Sample Sale. Shop for women's apparel at reduced prices at the Anna Valentine Sample Sale.